How I made 2 more Affiliate Sales with this little trick! →How I made 2 more Affiliate Sales with this little trick! 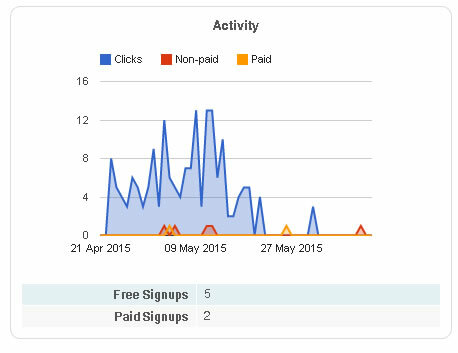 It’s crazy how this little thing I did generated 2 more affiliate sales from this blog. What’s even more awesome is the fact that these are sales that pay recurring commissions. That means I’ll be getting paid for as long as these 2 buyers don’t cancel their accounts. I want to reveal the exact steps I took (not revealing the product though) and mind you, if you follow these steps, you’ll make sales too except your blog is a ghost town. One thing I want to underline here is that it’s not something completely new. Others have been doing it and seeing results. You might have even done it. However, we are seeing it from an angel that generates sales. You don’t need 1000s of daily readers to make money from your blog. All you need is a working strategy. If you have 50 – 100 daily readers, you can still make enough money to pay some of your bills. Knowing your readers and what they want is the first step towards making money online. Secondly, knowing what you have and correctly using it to meet the needs of your readers crowns it all. The more needs you meet, the more money you make. Period! So here is how I used a simple trick to generate 2 more Affiliate sales! Do you know why I’m sharing my strategy with you? It’s simply because it works. If you try it, you’ll see results – maybe make even more sales than I did! Identify an affiliate product that’s targeted to your audience. Write a detailed review, bringing out both its features and uses. Stress more on uses. NB: This is not the strategy yet. However, it can generate sales. This is as a matter of fact, the best way to empower your blog to make huge money. The more relevant products you review, the more sales you make. If you focus on reviewing products that pay recurring commission, your earnings will soon shoot through the roof. It’s just as simple as that. With time, if your article is written with some search engine friendliness, you begin to get traffic from search engines. I know there are lots of things you can do to give live to your old articles. You may want to use plugins to revive old posts or show them somewhere on your sidebar, etc. Clone My Blog Post Idea That Generated $525 Paypal Cash! Increase search engine traffic Guaranteed! Little known trick exposed! Google Search Console is a huge weapon in the hands of bloggers. Unfortunately, some of us undermine its importance. So here is how I used it in the process to generate those 2 extra sales. I spent some time studying those keywords that bring traffic to my blog. I found out my review post is getting some drops from a keyword I didn’t target in the article. So what I did was re-optimize my post for that keyword. The results was boom – first page of Google. Take your time to read those articles above. You’ll discover how I re-optimize to rank better. 2 – I re-posted the article! I’m sure you do have some excellent articles buried right deep on your blog. No one is seeing them. They may have poor value for search engines so not even a single visitor from Google or others. You may also be using this plugin (or similar) to revive old posts but I can say from experience that re-posting gives your old article fresh exposure. Do some tweaking, adding some new stuff. Update and make it valuable and relevant. If you wrote the article on something that’s outdated, don’t re-post. The affiliate product review post that generated these 2 sales was written in 2014. By the time I re-posted, it was getting less traffic. Practically, there was no traffic from my community members. It was almost completely forgotten except for some few clicks from Google. How do you re-post old post? Re-posting old blog post is quite simple. The first thing to do is open to edit the article to re-post. Then change the published date and time to current date and time. NB: The published date and time should be server date and time not your local date. For the most part, they are always different. If you have an old money making blog post, edit and re-post. That should generate additional sales. Stick the article to the home page for a couple of days. I know some themes don’t support sticking articles but most Genesis child themes do. Share this post on social media if you like it. I’m sure your friends will too. Drop a comment below and let me know about how re-posting has worked for you. It seems really simple. I have trouble doing my project work to return the investment. And the more I read and study still have difficulties. This reliving posts have done recently, but did not show results. But trying to follow and the other tip well. You have to practice what you read. Do you do affiliate product review? This looks pretty simple…Why not try this out! Let me share it with my followers. Have a great beginning of the week! Here are my 2 more cents to increase affiliate earnings of the products. Always make sure to create awareness about the products you promote (email list is the key here). Also try to publish honest and unbiased product reviews instead of just writing to increase sales. And I really liked your tips Enstine. Shared it! Thanks so much for sharing and for the really encouraging mention! It’s interesting that a new study came out and it suggested that nearly 50% of website visitors leave a business blog because of a lack of message. That’s powerful and a sad truth! The other reasons are almost tied directly to that so I think the real number could be higher. I LOVE Google Webmaster Tools and now that it’s tied into Google Analytics the information you can glean is incredible. While I like your strategy, why not modify the article, tell a relevant story to a target audience and link it to the original? It seems to me you can get more bang for your buck and make a greater impact if it’s target well? Have a great week Enstine and thanks again for mentioning me! I am actually not into the monetization stage as of yet (working on few things in the background), so I would definitely be referencing to this post very soon! As for reviving the old posts, I so agree that we just don’t need to revive them but to tweak them. The posts related to any services, software, technology, strategy, and of course reviewing posts do need to be updated with latest information because by the time we had written, things do get changed overtime. Impressive post there, mate! Happy to share it! By the time you start monetizing, it’s going to be a great going. Thanks buddy for being part of this post and for sharing on social media. Just as simple as that! I do have some old post on affiliate plugins and programs that I need to brush up. They haven’t gotten a lot of traffic and right now will be a good time to add the keywords to get the most targeted traffic. Thanks for the share Enstine! Have a great week! I haven’t done this myself because I haven’t written much affiliate reviews on my blog. However, I did start a little while back and the step by step process you have given is a great idea. Lately I have put up another blog whereby I do 15 minute interviews with product creators I affiliate. So far so good, but my master plan is to integrate those on my regular blog. Thanks for the tips. I sure will put that into motion. Really awesome article inspired me how little change works amazingly! Hope you can able to get more affiliate sales! Crazy simple trick to generate more Affiliate sales step by step detailed article. Why not try this out! Definitely! However, thanks for sharing an Excellent article with us. Would love to know more from you! keep it up bro. Once again you conquered in the niche. I’m fond of your writing style and your audience engaging strategy. Definitely GWT is an awesome tool for bloggers. I really like your content re-publish concept and I’ll definitely go for it. Thanks for updating such a nice information. I haven’t really experimented with retweaking and reposting as you have brilliantly explained here…however, from the vivid explanation you have, I’m certain it’s going to work like magic! It’s just so sad that many webmasters fail to lookout out for the basic keywords that land visitors to their sites (and exploit them creatively). Your posts, my dear Enstine, are always enlightening. Nice post.Recently made a sale at clickbank ($12.36) and it’s my first affiliate marketing sale.I learned online to learn aff marketing but your blog encouraged me more to enter in blogging and affiliate marketing. Sticky a post is a good feature to keep the post always on the top and get more attention from readers. Re-posting is huge Enstine. I saw sales from an old affiliate product post after sharing it without even tweaking it. Add in the tweak factor and you have a ton more link juice and some more unique traffic too. Don’t work too hard creating new stuff when you can tweak old stuff in minutes and capitalize on your still fab content. Leverage the heck out of it. Affiliate marketing is quite a huge income source when explored within a carved out NICHE. That is, when you’ve got target audience in a specific location with a special need. Nice write up, again! I never thought of re-posting an article, nor optimizing an older article based on keywords that are unintentionally driving traffic. Both great ideas! This looks pretty interesting and easy to do. Maybe I will give it a try! Have a grea day! Thanks for Sharing Great Post .Recently made a sale at clickbank and it’s my first affiliate marketing sale . Why thank you for mentioning my course here in your post. You are the man who everyone can definitely learn from when it comes to making money online. I’m always so interested to see what you’ll teach next because you find some of the most interesting things to share with your audience. Now when it comes to making money you are definitely the go to guy that I send people to. I mean who doesn’t want to learn from the best right and just like your tips here in this post. Thanks for sharing this and again for the mention. Hope you’re doing well and have a wonderful week. I love such moments too and thanks for coming back and give me a boost. So excited about you sharing this on social media too. This is my first comment on your site. But i am a good follower of your site. I study your articles regularly. The two strategies you explained in this affiliate marketing is a great idea. I am my pleasure to say that, affiliate marketing is my main business and this helps me a lot to know about various strategies. It will be helpful, if you update more and more articles like this. Thank you…. Okay sure..I want to gain more and more knowledge from you. Your updates in the site were really good. So i’ll surely comment regularly in your site. You see my site and try to do some comments. Feeling very excited!!! Google webmaster is a valuable tool if we know how to take advantage of it’s useful data it present; I too have discover some keyword opportunity that could easily be rank for on first page of SERP. Thanks for sharing your experience with us, good to see how you nail the sales. Interesting post enstine. All of your posts are worth reading, certainly this one too. I also like the way you make affiliate sales by offering your products free to those who purchase from your affiliate links. Nice little trick you got here. Thank you for sharing. I would love to go over your blogs. Great Ideas/thoughts Enstine, Simple techniques but well worth to try. Thanks for sharing these.